The report “Children and Internet use: A comparative analysis of Brazil and seven European countries” presents the state of Internet access and use by children and adolescents in Brazil and seven European countries. One of its main findings is a trend toward more private access to the Internet by 9- to 16-year-olds in Brazil, Belgium, Irland, Italy, Portugal, Romania and the UK. The report, which is based on comparable surveys conducted between 2013 and 2014 in the participating countries, showed a significant presence of Brazilians on social networking sites (SNS), compared to other countries. The Brazilian dataset is from the ICT Kids Online Brazil 2013 survey of the Brazilian Internet Steering Committee (CGI.br), conducted by the Regional Center for Studies on the Development of the Information Society (Cetic.br), a department of the Brazilian Network Information Center (NIC.br). In the Brazilian survey, interviews were conducted with 2,261 Internet users 9 to 17 years old, as well as with their parents or legal guardians. 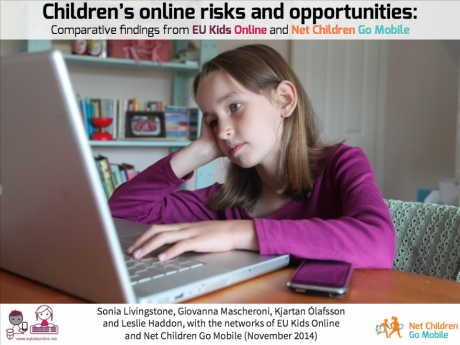 The European dataset was produced in the Net Children Go Mobile project. In Brazil, Internet access by children at school was lower but the country surpasses other countries in access to mobile devices and the presence of 9- and 10-year-olds on SNS. According to the report, one out of three Brazilian children Internet users accessed the Internet on the move (33%), a figure higher than that of countries such as Romania (15%), Ireland (13%), Portugal (13%) and Belgium (11%). Access in the bedroom or another private room at home was common among children from nearly all the countries analyzed: over half (56%) in Brazil; 85% in Denmark; 70% in the UK; 69% in Italy and Romania; and 60% in India and Portugal. Belgium was the only exception (48%). At school, Internet access was reported by only one-third of the Brazilian children that use the Internet (36%). This proportion was lower than that observed in most of the European countries analyzed: UK (88%), Denmark (80%), Romania (53%), Portugal (49%), Ireland (47%) and Belgium (39%), with the exception of Italy (26%). “Instead of restricting children’s access to the Internet, Brazilian schools should value the activity and invest in this technology, allowing children to fully explore the potential of the Internet and learn the skills for safe Internet use”, says Alexandre Barbosa, manager of Cetic.br. Watching video clips and visiting SNS were the most reported activities for children 11 to 16 years old across the studied countries. Danish (70%), Romanian (58%), Irish (49%) and British (49%) children preferred to watch videos online, while visiting SNS was reported as the main activity by Italian (59%), Brazilian (52%), Portuguese (50%) and Belgian (48%) children. Regarding the presence on SNS, 78% of Brazilian children Internet users had their own profile, which was the same in Romania (78%) and not far from Denmark (81%). Across the analyzed countries, Brazilian 9- and 10-year-old children were the most present on SNS: Romania (50%), Denmark (41%), Portugal (26%) Belgium (22%), the UK (19%), Italy (15%) and Ireland (14%). Another finding was that a significant portion of Brazilian children reported having a large number of online contacts and did not show much concern about maintaining public profiles on social media. In Brazil, over half the children (54%) reported having more than 100 contacts in their main SNS profiles, similar to Romania (64%). Furthermore, 42% of Brazilian children set their SNS profiles to public, whereas in Italy that percentage was only 15%.